Cebu Pacific Air is planning to grow its long-haul network from one to six destinations over the next six months. In addition to the already announced new destinations of Sydney and Kuwait, the Philippine low-cost carrier is close to setting a launch date and beginning ticket sales for Dammam and Riyadh in Saudi Arabia. Cebu Pacific is also aiming to launch Honolulu in early 2015 and is keen to secure additional traffic rights to the UAE to enable the launch of Sharjah. Cebu Pacific already serves Dubai, its only current long-haul destination which is now performing relatively well following an extremely disappointing initial performance. The forthcoming network expansion will provide the biggest test yet for Cebu Pacific’s long-haul unit. In the first 14 months of widebody operations Cebu Pacific has mainly used its fleet of A330-300s to operate regional routes. This is the second in a two part series of analysis reports on Cebu’s now 14-month-old widebody operation. The first part focused on the Manila-Sydney route, which will be launched on 9-Sep-2014, and connection opportunities beyond Manila. This report looks at Cebu’s plans for Saudi Arabia and the prospects of a Sharjah service. It will also examine the overall Philippines-UAE market including Cebu’s performance in Dubai. Cebu Pacific’s second long-haul destination will be Kuwait, which will be served with three weekly flights from 2-Sep-2014. Manila-Kuwait will be a unique route for Cebu’s long-haul unit as it is the only route among its first six long-haul routes (including five that have not yet been launched) that is not currently served non-stop by any carrier. The Manila-Kuwait market is now served on a one-stop basis by several carriers, led by Emirates, Etihad Airways and Qatar Airways. Cebu Pacific is banking on Kuwait having a sufficient Filipino community to support a non-stop service. Kuwait does have a sizeable Filipino community – approximately 200,000 – although it is smaller than the Filipino communities in Cebu’s other initial long-haul markets (the UAE, Saudi Arabia, Australia and Hawaii). Cebu Pacific began selling Kuwait in Jul-2014 – at the same time as Sydney. Unlike the Sydney market, where Cebu Pacific expects some outbound Australian leisure traffic as well as a significant share of transit traffic, Kuwait will be virtually entirely a point to point Filipino labourer market. Cebu Pacific will be the ninth LCC serving Kuwait, according to OAG data. But it will be the first LCC in Kuwait with long-haul services. LCCs currently account for about 30% of total seat capacity at Kuwait International Airport. Kuwait-based Jazeera Airways is by far the largest LCC in the Kuwait market and its approximately 14% share of total seat capacity makes it the second largest airline in Kuwait after flag carrier Kuwait Airways. Jazeera could emerge as a potential partner for Cebu Pacific as its Kuwait base features 15 routes throughout the Middle East, Egypt and Turkey. But at least for now Cebu Pacific is targeting the local Kuwait-Philippines market and the approximately 200,000 Filipinos living in Kuwait as well as their families residing back in the Philippines. Saudi Arabia is also expected to be almost entirely a point to point market for Cebu Pacific although there could potentially be an opportunity to work with Saudi LCC flynas. Cebu Pacific has not yet set a launch date or begun tickets sales to Saudi Arabia but has been preparing for the last year to serve both Dammam and Riyadh. Initially Dammam and Riyadh were slated to be Cebu Pacific’s second and third long-haul destinations after Dubai, with a launch anticipated in 1H2014. But Cebu Pacific has encountered several delays in securing approvals from Saudi authorities. 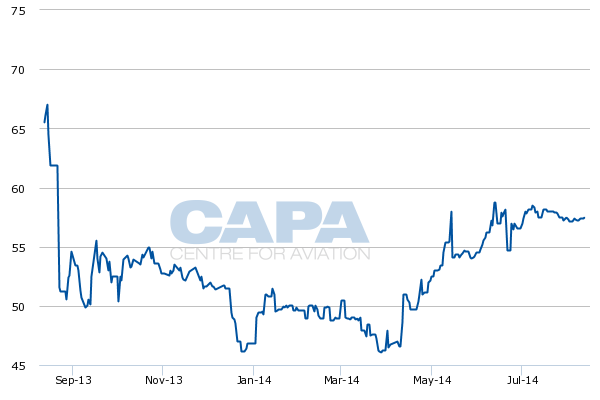 The general manager of Cebu Pacific’s long-haul division, Alex Reyes, told CAPA prior to CAPA’s Australia Pacific Aviation Summit (held in Sydney on 6-Aug-2014 to 8-Aug-2014) that that the final approvals from Saudi Arabia should be secured shortly, allowing for a launch within the next couple of months. “We are about ready to push the button,” he said. As passengers (or their labour contractors) in the Philippines-Middle East market typically make purchasing decisions with short notice, Cebu Pacific believes it can launch Saudi Arabia within only a few weeks of starting ticket sales. Cebu Pacific is initially planning to operate three weekly flights to Dammam as well as three weekly frequencies to Riyadh. It will compete against Philippine Airlines (PAL) on both routes, which launched Manila to Dammam and Riyadh services in late 2013. PAL currently serves Riyadh with four weekly A330 flights and Dammam with three weekly A330 flights, according to OAG data. 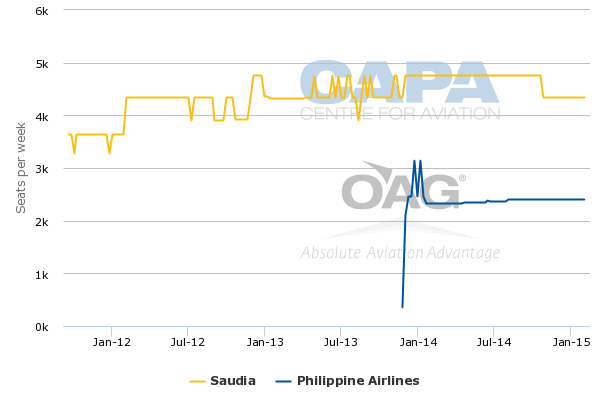 Saudia also serves the Manila-Riyadh market with seven weekly flights and operates three weekly flights from Manila to Dammam, according to OAG data. Mr Reyes said that Dammam, Riyadh, Kuwait, Sydney and Dubai will use the equivalent of three A330s. That will leave the equivalent of two A330s for short-haul routes. Cebu Pacific plans to take its fifth A330-300 at the end of Aug-2014 (prior to the launch of Kuwait and Sydney). Cebu Pacific sees leaving two aircraft for short-haul flights as ideal given the success it has had over the past year in operating A330s on short-haul routes. Mr Reyes told CAPA TV in a 6-Aug-2014 interview that Cebu Pacific has discovered the A330 is efficient for shorter sectors, enabling the airline to lower its cost per seats in thick short-haul markets. The sixth and final A330-300 from Cebu’s current commitment with leasing companies is slated to be delivered in 1Q2014. This aircraft will support the launch of services to Honolulu, which Mr Reyes says will initially be served with three weekly flights. Cebu Pacific is now working on securing FAA authority to operate flights into the US. Previously the carrier was unable to even seek such authority as the Philippines had a Category 2 safety rating. Philippine authorities secured a Category 1 rating in Apr-2014, enabling Philippine Airlines (PAL) to pursue expansion and gauge changes in the US market and enabling Cebu Pacific to begin preparations to enter the US market. While Cebu Pacific is only committed to one additional A330 beyond the fifth aircraft it will take at the end of Aug-2014 the business plan for its long-haul unit has always envisioned a fleet of eight A330-300s. Cebu Pacific is now looking at potentially leasing two more A330s in 2015 (in addition to the one aircraft already committed for 1Q2015), giving it a fleet of eight aircraft by the end of 2015. The two additional aircraft will enable further expansion of the long-haul network beyond Honolulu, which is expected to become Cebu Pacific’s sixth long-haul destination after Dubai, Kuwait, Sydney, Dammam and Jeddah. One option under consideration as Cebu Pacific’s A330 fleet expands to up to eight aircraft in 2015 is Sharjah, which the carrier served briefly from 1-May-2014 to 20-Jul-2014 during the runway repair project at Dubai. Cebu Pacific does not want to rely significantly on inbound tourism although in markets such as Australia inbound traffic is being pursued (along with transit traffic) to help make the market viable. Sharjah is a more traditional Cebu Pacific market as it will cater to Filipino workers with the added benefit of being an LCC hub, enabling connections to destinations throughout the Middle East (as well as parts of Eastern Europe, Central Asia and Africa) which have Filipino populations but may not be large enough to support non-stop service. Air Arabia’s Sharjah hub currently consists of almost 1,000 weekly flights to about 60 destinations. 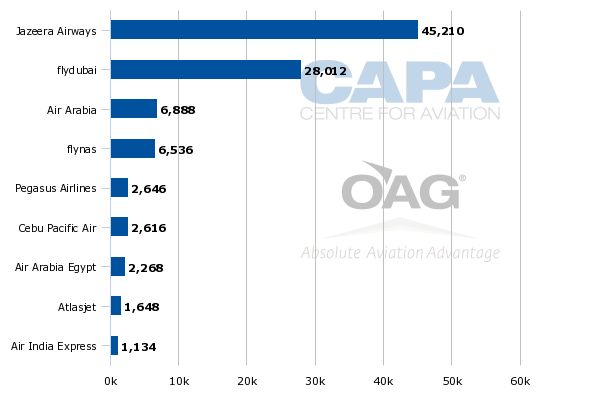 Air Arabia currently accounts for an overwhelming 83% of total capacity at Sharjah, according to CAPA and OAG data. In terms of seat capacity Air Arabia’s Sharjah hub is about four times the size of Jazeera’s Kuwait hub and about double the size of flynas’ hubs in Riyadh and Jeddah. The Dubai hub of the Middle East’s other main LCC, flydubai, is about 50% larger than Air Arabia’s Sharjah hub. But a Cebu Pacific-flydubai relationship is unlikely given flydubai’s ties to Emirates, which competes against Cebu Pacific in the Manila-Dubai market. Emirates is also a large one-stop carrier in other Manila-Middle East markets (such as Kuwait and Saudi Arabia) that Cebu Pacific is now preparing to enter. Mr Reyes said Cebu Pacific is now looking to add Sharjah on a permanent basis to leverage the connection opportunities with Air Arabia as it was pleasantly surprised by the transit traffic generated during its time in Sharjah. Air Arabia in particular promoted connections to Manila from the Saudi Arabian cities of Dammam, Riyadh, Gassim and Hail with one-way through fares starting at SAR1250 (USD333) including checked bags and a meal. Cebu Pacific returned to Dubai International Airport in Jul-2014 after the recent completion of the runway renovation project. Cebu Pacific is not considering moving its Dubai International flight to Sharjah (or Dubai World Central) and remains committed to Dubai, where its load factor has improved significantly after a dismal start. But it believes there is sufficient demand in the Philippines-UAE market to support separate services to both Dubai and Sharjah. Cebu Pacific originally was looking at supplementing Dubai with Abu Dhabi but now sees more potential in Sharjah, partly because of the connection opportunities with Air Arabia. There is also a sizeable Filipino community in Sharjah and in the part of Dubai that is close to Sharjah. Cebu Pacific however first needs to secure additional UAE traffic rights before a service to Sharjah can be added. Cebu Pacific has long pushed Philippine authorities to adopt a policy of prohibiting Filipino carriers from loaning their traffic rights to UAE carriers. As part of codeshare deals PAL over the years has been able to loan its traffic rights for the UAE to Emirates and Etihad, which lacked the ability to expand as they were fully utilising their own traffic rights. Etihad is no longer using PAL rights but Emirates is still using seven weekly traffic rights allocated to PAL to support one of its three daily flights to Manila. These rights are expected to be returned and could potentially be reused by PAL or partner Etihad to expand in the Manila-Abu Dhabi market. If they are not reused by PAL the rights could be reallocated to Cebu Pacific. The UAE also has been seeking an extended air services agreement with the Philippines. This could enable Emirates to maintain three daily flights without having to use PAL’s rights for one of the flights as well as potentially support a new service from Cebu Pacific if it is unable to secure the Filipino carrier rights now used by Emirates. There are currently 28 weekly flights allocated to both sides under the Philippines-UAE air services agreement. Of the 28 weekly flights available to Filipino carriers in the UAE market 26 are currently used, including seven from Cebu Pacific (to Dubai), seven from PAL Express (to Dubai), five from PAL (to Abu Dhabi) and seven by Emirates on behalf of PAL (to Dubai). Of the rights available to UAE carriers, 14 are currently used by Etihad (from Abu Dhabi) and 14 by Emirates (from Dubai). Operating two (likely daily) routes to the UAE seems rather ambitious given the initial challenges Cebu Pacific faced in the Manila-Dubai market. But Cebu Pacific is confident it has overcome the initial setbacks and believes the Philippines-UAE market is growing rapidly and can support more LCC flights, particularly given the stimulation effect of low fares. Mr Reyes says the total number of passengers travelling between Manila and Dubai has grown by 30% over the last year (includes passengers flying via other cities such as Hong Kong). Some of the growth was driven by stimulation as lower fares in the market have enabled more frequent trips home for Filipinos as well as visits from friends and family living in the Philippines. The number of Filipinos working in Dubai and the UAE also has continued to grow more than anticipated. Dubai is now the largest outbound Filipino market, giving Cebu Pacific confidence it can maintain a daily Dubai service as well as add a second destination in the UAE. Sharjah also offers connection opportunities as Cebu Pacific is keen to pursue an expanded and potentially more formal relationship with Air Arabia. With Filipinos spread across the Middle East, using Sharjah and Air Arabia to serve the rest of the region is logical. Cebu Pacific has looked at other potential non-stop routes in the Middle East including Bahrain, Oman and Qatar. A more sensible approach would be to serve these and other smaller Filipino worker communities via Sharjah and not growing the Middle East network beyond five destinations (and three countries). Cebu Pacific is also confident recent improvement on its Manila-Dubai route, which Mr Reyes says is now “doing quite well,” shows more capacity to the UAE and Middle East can be supported. While Cebu Pacific is keen to diversify its long-haul network with Australia and Hawaii the Middle East remains the main focus of its long-haul strategy. 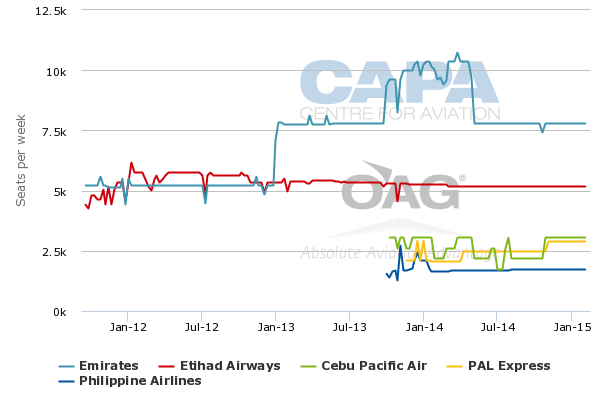 As CAPA previously analysed, Cebu Pacific’s average load factor on Manila-Dubai was a dismal 36% in the first month of operation, Oct-2013. But the load factor started improving in late Nov-2013 and after still struggling in 1Q2014 was above 80% in Apr-2014, May-2014 and Jun-2014. Cebu Pacific has not provided data on July but it likely dipped due to low demand during Ramadan despite a temporary reduction to four weekly flights during the fasting month. Mr Reyes is confident in the future success of the Dubai route as the carrier has made adjustments in its sales and distribution approach after learning about the nuances of the Philippines-Middle East market. While Cebu Pacific was disappointed with the new initial performance Mr Reyes points out new routes typically take a year to mature. For example the airline had even lower initial load factors on some regional international routes launched in recent years – although obviously the losses were significantly lower as they were shorter routes operated with narrowbody aircraft. Cebu Pacific’s long-haul operation seems to have gotten over the hump and is on the path to an improved performance. But it still faces huge challenges and a relatively sceptical investment community. Cebu Pacific’s stock dropped by about 40% in the last seven months of 2013 – the first seven months of the A330 operation – as the new long-haul operation dented its profitability. The stock has recovered partially so far in 2014 but is still trading almost 30% below May-2013 levels. Even with the Dubai route performance improving, Cebu Pacific has not yet proven its version of the long-haul model can be successful. The adjustment to focus more on transit traffic, starting with the pursuit of North Asia connections on the Sydney-Manila route and to potentially be followed by a partnership with Air Arabia at Sharjah, should help. But Cebu Pacific still has a long road ahead. Australia will be particularly challenging as Cebu Pacific faces stiff competition and potentially overcapacity as PAL is increasing its Manila-Sydney service from four weekly flights to daily in Dec-2014. Cebu Pacific also plans to add a fifth weekly frequency to Sydney from Dec-2014 while Qantas maintains its Manila service at four weekly flights. Honolulu will also be challenging from a competitive standpoint as PAL is increasing Manila-Honolulu from four to seven weekly flights ahead of Cebu’s expected entry into the Hawaii market. PAL’s response thus far to Cebu Pacific’s long-haul expansion has been extremely aggressive. PAL also launched Dubai and Abu Dhabi at about the same time as Cebu Pacific entered Dubai and also has launched Dammam and Riyadh ahead of Cebu Pacific. Virtually everywhere Cebu Pacific has turned with its long-haul operation PAL has fought back with new flights and requests for more traffic rights. But Cebu Pacific is prepared to weather the storm. If anything PAL is more likely to retreat as questions again surface over PAL’s future ownership structure. Already the PAL Group has adjusted its Middle East expansion plan by deciding against taking another five A330-300s in single class configuration. Initially six A330s from the group’s A330 order had been allocated to regional subsidiary PAL Express for use on routes to the Middle East in 414-seat single class configuration. PAL Express now operates only one A330-300, which it uses to compete against Cebu Pacific on the Manila-Dubai route, but is no longer planning to expand this operation to other Middle Eastern markets. Cebu Pacific’s long-haul unit clearly faces a critical juncture over the next six months as it launches five routes. How the five new markets perform and how well Dubai does in its second year – as well as what happens with the PAL Group – will be key drivers in determining the pace of future Cebu Pacific widebody expansion. While the current business plan envisions only eight A330s a phase two featuring new generation widebodies has always been a possibility – and a necessity if Cebu Pacific is to keep up with Asia-Pacific’s other rapidly growing long-haul LCCs. Cebu Pacific is now evaluating the A330neo, which AirAsia X signed up for in Jul-2014 as the launch airline customer with 50 commitments. Cebu Pacific was already evaluating the A350, 787 and the 777X. The latter is still several years away but would enable flights from Manila to the west coast of the US, which have traditionally been PAL’s largest and most lucrative long-haul markets. Cebu Pacific does not see the A350 or 787 as a possibility for California (as the variants that may have the range are too small for Cebu’s requirement) but could use either type or the A330neo to pursue growth to the Middle East and Australia and replace current generation A330-300s. Cebu Pacific certainly will have several options as it looks to grow its long-haul fleet and network. But first it needs to get the basics right and make sure it has the right long-haul low-cost model for its market. Adjustments will be necessary as the long-haul low-cost sector is evolving rapidly and the Southeast Asian market is extremely dynamic. Cebu Pacific is now barely scratching the surface. Cebu Pacific is still too new to the long-haul low-cost game to determine if it will be a winner.